There is so much to get excited about during the holidays, but I think holiday parties are the most exciting for me. Whether I’m hosting or attending, I love a great holiday party with festive decorations, jingle bells, and GOOD FOOD. Your food can be mediocre all year, but if your holiday party food is slammin,’ people will love you and no one will remember anything else. The key to entertaining during the holidays is to set yourself up in a way that makes sense.There is so much going on. You have to be smart about it. Keeping foods on hand that can be prepared quickly, and in a variety of different ways can be a lifesaver. I picked up some Johnsonville® Vermont Maple breakfast sausages because they are going to make a great appetizer on Christmas eve when everyone is trying to mingle and eat light bites. Then, in the morning in a casserole or with biscuits for Christmas morning breakfast, they will be something totally different and delicious. Also, there is seriously not one party dish you could possibly make for the holidays that sausage wouldn’t be fantastic in. Not one! Here’s another tip, consider your company. In my house, we never…ever…eat our big Christmas dinner on time. Even though we say every year we are going to, it never happens. Since I know this, I try to have appetizers on hand for cousins who are watching the game, anxious children, and any innocent bystanders who aren’t hip to my family’s shenanigans. 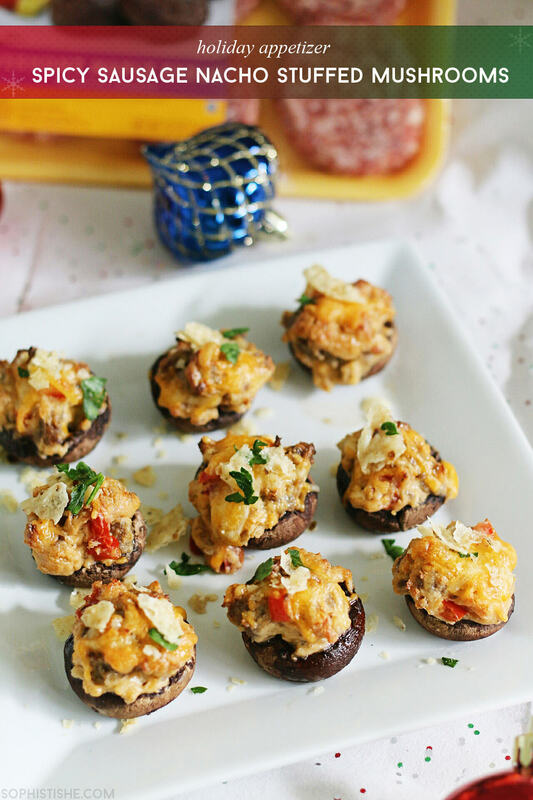 These nacho stuffed mushrooms are going to be a hit at your holiday party! They are delicious and super easy to make. I love the sweetness of the Vermont Maple syrup in the the sausage. You don’t expect it because it’s a stuffed mushroom, but it’s so delicious you don’t care. If you’re guests are anything like mine, they won’t mind if dinner isn’t ready in time if you make these. Trust me. Preheat oven to 400. Add a tablespoon of oil, or pan spray to a saucepan on medium heat. Brown sausage and break up with a spoon until thoroughly cooked and in bite size pieces. Remove meat from pan and set aside. In the saucepan, add peppers, onion, Jerk seasoning and garlic and cook for 2-3 minutes. Add meat back to pan and turn heat down to low. Add cream cheese and half of the cheddar cheese until melted. Line mushroom caps on a baking sheet and fill with sausage mixture. If you have leftover filling you can serve it by itself as a dip, or put it in an airtight container in the fridge for later use. Top with remaining cheddar cheese. Bake for 20 minutes. Top with crushed tortilla chips and serve immediately. Enjoy! What appetizer are you looking forward to enjoying this holiday season? For more holiday recipe inspiration and Johnsonville® product information, follow them on FACEBOOK and TWITTER! Linking up with An Oregon Cottage. Amanda 'Mandi' Buckner is a professional chef and co-owner of <a href="http://www.chewsylovers.com/">Chewsy Lovers</a>, a food lifestyle brand for couples, and the author of The Chewsy Playbook: A Guide to Throwing a Perfect Game Day party. She loves pearls, a bad shoe, and anything "girly-frilly-frou-frou-licious"! She resides in South Florida with her husband and three children. Thanks for this post, I think am going to tackle this for Christmas Dinner! Let us know how your family likes them!